For Lily Drake, slaying vampires is easy...Dating them is the hard part. Deciding between pizza and Chinese take-out will no longer be one of the hard decisions facing Lily Drake once she is emerged into vampire society. Humanity or immortality? That doesn't hold a candle against this question - which of the two handsome vampire cousins? I know most of you remember the time when vampire books were the "thing". Everyone was writing them after Meyer’s Twilight which was obviously a big hit. Now days dystopian has taken over and I do love those. And some people are still writing books with vampires. I have stayed away from vampire books until just recently and I have read three that I have really liked but they have been on total opposite ends of the literary spectrum...good vampires bad vampires. I absolutely LOVED this book! It definitely made me open to read more vampire books. 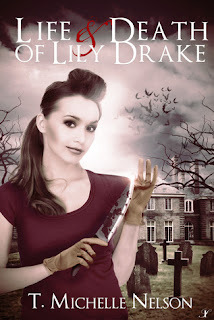 The Life and Death of Lily Drake is about a single mom named Lily who does the every day tasks of being mom and loving and taking care of her 12 year old son. Lily thinks she is going on a blind date but ends up being taken by a vampire to his mansion. These vampires are not your "normal" vampires. They make the comment that Lily had been watching to many movies. Not once did they "hunt" for blood or kill any humans. They don't sparkle and Yes! they can go out in the sun. Unless you knew they were vampires you could never tell. Lily doesn't start out as a vampire and she really doesn't want to be changed. She doesn't want to be that "chosen" vamp her Aunt Rose is telling her she will be one day. She has more important things to consider like raising her 12 year old son instead of killing the rouge vampires. Then one event changes everything. You know how you hear one sentence during the day that changes the course of your day or even your month, year, etc? That was Lily and the only way to save the one thing she holds closest to her heart in her life she must become a vamp. Lily knew the life she knew would change forever when she made that decision. But sometimes moms have to do things we wouldn't otherwise do for our children. Within just a few moments her life changed for eternity. Nelson's writing is so realistic. I know that doesn't really sound like a compliment, but it is. I could feel what Lily was feeling for her son. She transfers the reader straight into Lily's life as she meets Mathis, Val, and Rose. We experience Lily falling in love with Mathis and becoming best friends with Val. When once she had no family we are excited to see her now have Aunt Rose in her life. Even if she's a Great Great Great...etc. Aunt Rose. We feel the stress of Lily trying to stay human for her son but learn to fight off the other vamp's that are trying to kill her to keep her from becoming the "prodigal" vampire. Lily doesn’t want to be a vampire. But love for her family new and old, opens her eyes up in the end. She realizes that she’ll never be free of her destiny, but she can sure make the most of it. This book has surpassed all the other vampire books on my Kindle that are in that same category. Lily is a freaking awesome vampire. She is strong and courageous. I hope that this story continues because I can't wait to see what happens. This book and Lily deserve 5 stars! Read It!! You will enjoy it! Michelle, thank you so much for taking the time to read and review my book. I sooo appreciate the lovely things you had to say, and best believe Lily's story is HARDLY over! This looks like a different kind of tale...will have to look into it!